Johnson & Johnson (JNJ) engages in the research and development, manufacture, and sale of various products in the health care field worldwide. The company operates in three segments viz., (1) Consumer; (2) Pharmaceutical; and (3) Medical Devices and Diagnostics. The company was founded in 1886 and is based in New Brunswick, New Jersey. JNJ is a part of the dividend aristocrats, S&P500 index, and DJIA index. It has been raising its dividend for last 48 years. The latest increase in dividend was 9.3% in May 2010. My objective here is to analyze JNJ to determine fair price range for buying and adding to existing positions. Here I am looking at trends for past 10 years of corporation’s revenue and profitability. These parameters should show consistently growth trends. The trend charts are shown in image below. Revenue: Overall had a growing trend. Cash Flows: In general, a growing trend. The free cash flow is generally close to net income. 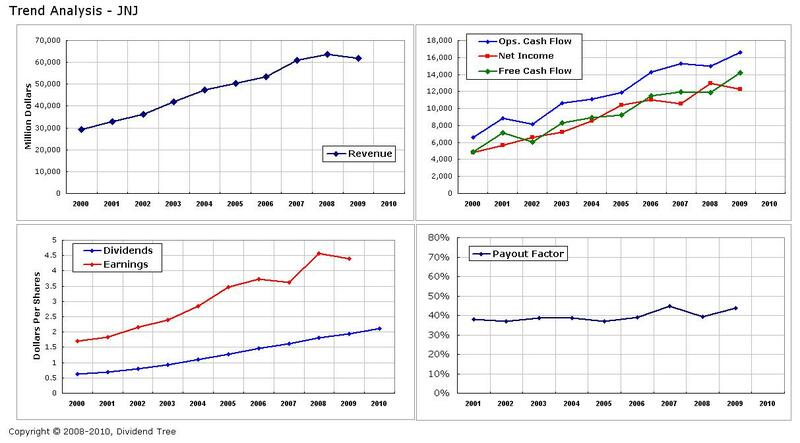 Operating cash flow is always higher than net income. EPS from continuing operation: Overall a growing trend. Here I use the corporation’s financial health to assign a risk number for measuring risk-to-dividends. The risk number for risk-to-dividends is 1.29. This is a low risk category as per my 3-point risk scale for dividend sustainability. Dividend growth rate: The average dividend growth of 13% (stdev. 2.5%) is almost same as average EPS growth rate of 13%. Dividends have grown inline with earnings per share. Duration of dividend growth: 48 years. Payout factor: It has been in the less than 40%. 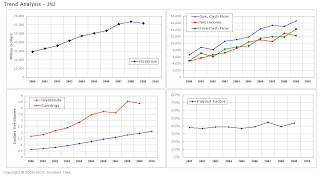 It was at 44% in 2009.
Dividend cash flow vs. income from MMA: Here, I analyze how the dividend cash flow stacks up against the income from FDIC insured money market account. The baseline assumption is (a) stock is yielding 3.6%; and (b) MMA yield is 1.75%. Last 10 years average dividend growth rate has been 13%, and I expect JNJ dividend growth rate to be 11%. With my projected dividend growth of 11%, the dividend cash flow is twice the MMA income at the price of $130. What this means is, I could pay up to $130 and still the dividends cash flow would be twice MMA based income. Is there anything more to ask for? The range of fair value is calculated as $52 to $63. JNJ is one the largest and most diversified health care company. For a company, which has 250 operating/subsidiary companies it is unique in a sense that it continues to perform with such a consistency year after year. It is a global company with approximately 50% of its revenue outside of US. All three market segments contribute significant portion of revenue. Investing in JNJ is a good proxy for foreign and emerging markets. JNJ is highly innovative and spends close 10% of its revenue on R&D and new product development. For growth, it uses organic internal opportunities and inorganic through strategic acquisitions. It generates free cash flow, which is generally, greater than its net income. It remains to be seen how JNJ is affected due to new health care legislation. Future risks include failure of any potential patent candidate or adverse effect of any existing drugs. I like JNJ’s large size, global reach, diversified revenue streams, and multiple products. JNJ is more about substance rather than panacea. It has very good balance sheet. The dividend growth follows the growth in EPS. At current yield, the dividend cash flow is almost four times the MMA interest income in 10 year time period. The stock’s current risk-to-dividend rating is 1.29 (low risk). Since the share price is my fair value buy range, I added to my existing company even though I am fully allocated. Full Disclosure: Long on JNJ.